Tinselman is Robyn Miller. Please enjoy his blog. 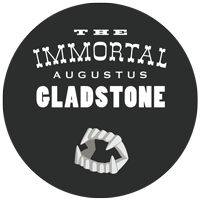 For the past month, I've been composing the soundtrack for The Immortal Augustus Gladstone. A few days ago, I shared the above piece, Close Friends with a Count, on twitter. We've been pretty quiet about the film but we're now almost finished with the entire project. Which feels good! Let me know if you have questions... about the film, about the music, about whatever you like (within reason of course). I'll answer whatever I can!